Every year around this time there is a name or two that shows up on the spring training roster that send the interwebs into a delirious state of being because THAT guy might make the team. This year I think it’s safe to say that guy is Javier Baez. Baez was highly touted last year, but after a stellar 2012 he is now considered a legit top twenty guy, not just in the Cubs system, but in all of baseball. Jonathan Mayo put that notion to paper, or internet web page, when he came out with his 2013 MLB prospect watch list, which has Baez sitting nicely at sixteen. That is seven full spots up from last year when he was at twenty-three, sure, seven spots might not seem like a major jump but when you crack the top twenty more people pay attention. We made a few trips to see the Cubs farm system in action, obviously the guy who impressed us the most was Jorge Soler, but a close second was Javier Baez. Why you ask? I’ll tell you my inquisitive friend, he exudes confidence, some might call it cockiness, well most everyone will call it cockiness, because that’s what it is. 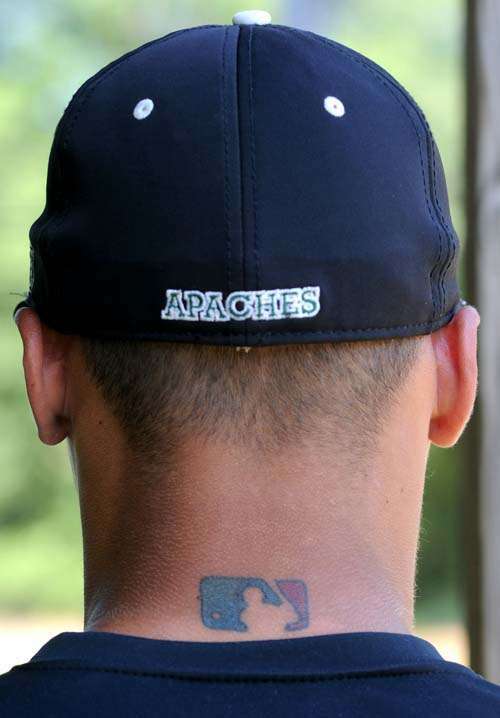 Baez knows he belongs, and knows he is good (the tattoo on the MLB logo on the back of his neck should tell you everything you need to know), he is twenty years old, I really don’t expect much more from him, but that’s where this whole experience thing comes into play. This camp isn’t about can Baez make the team, it’s about seeing how guys who will make the team go about their business, and for him to work on things at a different level. Jed Hoyer spoke to that, “He’s here to get a feel for what big league camp is all about, see how these guys go about their business,” general manager Jed Hoyer said of Baez. “It’s nice for fans to be able to see him, nice for us to be able to see him. But it’s not about making the major league team. This is about (getting) experience.” That’s exactly what I was hoping to hear out of Hoyer, there shouldn’t be unnecessary expectations for Baez, but that doesn’t mean you can’t get excited about seeing him in a spring game. Theo Epstein expanded on Hoyer’s comments by giving Cubs nation the following quote, he said that Baez “has a lot of work to do” before he gets called up. Most of that work will be learning how to work counts, because after all there is a Cubs way now, regardless, Baez needs to see more pitches to have his game translate to the big leagues successfully. So if you want to get excited about seeing Baez in a Spring game this year go for it, but don’t get excited because you think he will make the team, get excited because you are watching him take the next step towards making the team when he is ready, maybe that will be this year, you never know. Here is a recap for the month of July for the Cubs minor league system. There are a lot of players who had a good July, but I limited it to a player of the month/pitcher of the month at each level. The Cubs had a pretty good month of July to go along with a great start to the season and they are in first place as of today. There were a lot of exciting things happening in Mesa, mainly the debut’s of both Albert Almora and Jorge Soler. There were other exciting debut’s as pitchers Dillon Maples and 2012 draftees Paul Blackburn (56 overall) and Ryan McNeil (3rd round) started there professional careers. Finally Daniel Vogelbach just crushed the ball before being promoted to Boise. He left the Cubs hitting .324 with seven home runs, 12 doubles, and 31 RBIs. The 22-year old third baseman was drafted in the 35th round of this years draft out of Stetson University. This month he hit a robust .400. with one home run, six doubles, 14 runs scored, and 12 RBIs. He slugged .550 and had an OBP of .486 bringing his OPS to 1.036. In his first year in the organization, the 21 year-old pitcher has been very good. This month Martinez-Pulmarino was 1-0 with a 1.15 ERA. He pitched 15.2 innings in six games, all but one out of the bullpen. He struck out 14, allowed only five hits and walked four in July. Boise was off to a really rough start, but have been hot of late winning six out of their last eight and four in a row. Luckily for them the second half has just started, so as far as the second half goes they are off to a nice start. At only 19-years old the infielder has impressed with the bat thus far at Boise and July was no different. He hit .330 with four home runs, four triples, and three doubles. Amaya knocked in 13 and scored an impressive 24 runs while stealing six bags. He had an OBP of .407 and slugged .567 brining his OPS to .974. The 20-year old starting pitcher had quite a nice July. He started six games and went 3-0 with a 1.50 ERA. In his 30 innings pitched he gave up 21 hits, walked 14, and struck out 20. Scott was drafted last year in the fifth round out of Notre Dame Prep High School in Scottsdale, AR. July was not the best of months for the Chiefs and they will have some work to do to get back in the playoff picture. Catcher Chadd Krist came up from Boise and has continued to hit and Pin-Chieh Chen has been on quite a tear over the last couple weeks. Peoria will look to have a good August and make up a lot of ground in hopes to get back in the race. Wow did the 2011 first round pick have a great month. The 19-year old shortstop hit .368 with with seven home runs, three triples, and six doubles. Baez drove in 20 runs, scored 21, and stole eight bags. His OPS for the month was 1.076 as he slugged an impressive .679 and had an OBP of .397. It was quite the month for the highly touted Cubs prospect. Zeller, 24 pitched well in July going 2-2 with a 1.65 ERA in six appearances, five starts. He pitched 32.2 innings giving up 32 hits, walking seven, and striking out 14. He isn’t a huge strikeout pitcher and he gave up a hit an inning, but it is impressive to see the ERA as low as it was in the month. Daytona didn’t have their best month, but there were some highlights to go along with the disappointing record. Matt Szczur was promoted to Tennessee after Jae-Hoon Ha was injured. Szczur had been one of Daytona’s most consistent performers throughout the year and it will take some adjustments for them to get back on track without him. The Cubs will have to make up a lot of ground in August as they sit six games back going into today. At only 19-years old the second baseman is starting to really hit. After a disappointing first couple months Torreyes had a very good June and followed it with a nice July. He hit .333 with one home run, two triples, and seven doubles. He also drove in 18, scored 16, and stole seven bases. Torreyes was brought over in the Sean Marshall deal. Loosen went 4-1 in six starts in July. He had an ERA of 3.08 throwing 38 innings, giving up 26 hits, walking 13, and striking out 35. A sub .500 record in July wasn’t what the Smokies were looking for as they currently are 5.5 games behind the division leader. The month was highlighted when Matt Szczur was promoted to Tennessee. The reason he was promoted was because of an unfortunate accident when Jae-Hoon Ha got a concussion. The Smokies need to got hot in order to make a run at the division. The 24-year old first baseman has had a good season and July was no different. He hit .337 with four home run and eight double. Bour drove in an impressive 25 runs which brings him to 84 on the season. He slugged .529 and had an OBP of .381 with an OBP of .909. It will be fun to watch Bour’s pursuit of 100 RBIs. Jokisch, 23 was 4-1 with a 2.57 ERA in five July starts. In 28 innings pitched he struck out 2o, walked eight, and surrendered 21 hits. We all know the Cubs system is light on arms, but Jokisch has had a pretty good season up to this point. Things don’t get much worse than an 8-20 month, but maybe it is when August is starting and you are 24 games back. It was going to be tough when Rizzo was brought up, but I don’t think anyone was expecting a month like this. There weren’t too many bright spots, but there were some. Josh Vitters had a good month, not great, but good. James Adduci came up from Tennessee and did well in the 18 games he played in compiling and OPS of .999. All Iowa can hope for now is to end the season on a high note. The 25-year old outfielder had his best month since coming over from Reds. Sappelt hit .317 in July hitting one home run, one triple, and eight doubles. He scored 16 runs and drove in 12 while stealing eight bases. He got on base at a .368 clip and slugged .442. It was nice to see Sappelt have a good month and my guess is we will see him in Chicago at some point this season. I bet you didn’t expect to hear that name again, but he had quite an impressive month. In 18.2 innings Caridad gave up 14 hits, walked 7, and struck out 22 as his ERA stands at 0.92 for the month of July. if Caridad can continue we might see him again in big leagues. It wasn’t the best month for the Cubs farm system, but there were some good things as well as some really exciting things. There were a lot of hitters and pitchers who could have been included and narrowing it down to only one per level was tough. Hope you like it. Each half determines playoff teams, so the Chiefs just missed being the wild card team for the first half. The fact that the Chiefs finished so close to a playoff spot is amazing given their start to the season. The Chiefs went 11-3 in June to close the gap on second place Beloit but they came up just short, here’s a recap of the first half. 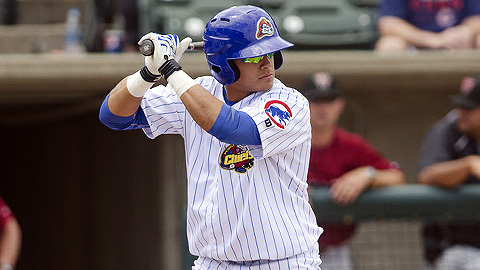 The addition of 2011 first round draft pick Javier Baez was a big reason for the Chiefs resurgence. Baez appeared in 18 games and hit .317 with 4 HR’s, and 11 RBI’s, he also had 7 stolen bases in 7 attempts. Midwest League pitchers had a hard time keeping Baez off base as he finished the first half with a .419 OBP, and a .975 OPS. Dustin Geiger, and Anthony Giansanti were also late additions to the Chiefs team that had big impacts. There were a number of standouts on the mound for the Peoria Chiefs as the entire pitching staff seemed to find a groove down the stretch. PJ Franceson who has since been promoted to double A was outstanding early on the help the Chiefs stay afloat amid a rough start. Franceson was 5-1 with a 1.86 ERA in nine starts before his promotion. Another pitcher who paced the Chiefs wasn’t even a pitcher for his entire career. Kyler Burke was an outfielder before making the change to become a pitcher, so far that decision seems to be the right one. Burke finished the first half 2-2 with a 2.31 ERA in 15 appearances (10 starts). Jeffrey Lorick, Hunter Cervenka, Sheldon McDonald, Luis Lira, and Michael Jensen all had great first half performances on the mound. I’m expecting a big second half for the Peoria Chiefs. Continued progression from Baez, Geiger, Giansanti and an already talented pitching staff should only mean good things for Peoria. Not to mention the possible influx in talent from any 2012 draft picks that might be making the jump towards the end of the season. Add this all up and the future of the Peoria Chiefs and Chicago Cubs for that matter is very bright. Thanks for reading, go Chiefs! school numbers are ridiculous however, where he hit .711 with 20 home runs. He did have an opportunity to play briefly with the rookie level AZL Cubs before moving to Boise for a couple of games. Baez, who was drafted as a shortstop will continue to play there, but it appears a move to third base might better suit his defensive skills. Not saying he will be a bad defensively, but what will separate Baez from others is his bat. Unfortunately the sample size is too small to get an accurate prediction, but by all accounts his offense has the potential to be special. Currently Baez is playing for the Cubs extended spring training squad in Arizona, and he’s putting up some big numbers. Baez was 2-for-4 today with two home runs, one of which was a grand slam, he finished with six RBI’s. Baez cam into the game hitting .329 coming into the game with 82 plate appearances. Baez now has 8 home runs, and 26 RBI’s in 24 extended spring training games. The sky is the limit for Baez, I would expect him to play for the Boise Hawks once extended spring training breaks and Boise opens their season. One thing is for sure, you might not want to miss what Baez is doing, we’ll do our best to keep you updated. ** Thanks to the CubReporter and Arizona Phil for doing a fantastic job tracking the extended spring training Cubs, he has a great site, go check it out here. [UPDATE] – Reports from the Tribune say that Baez is close to being optioned to low A Peoria, not Boise. Cubs are really taking notice of Baez’s play.